Top Ten Reads of 2018 – Bombard the Headquarters! 1.Kiss of the Spiderwoman by Manuel Puig. I loved the movie adaptation (one of my favorite films), which definitely gave justice to the novel and which I saw first before reading the actual book because it took me so long to find a copy (which I finally did in Booksale). 2. Public Sphere and Experience: Analysis of the Bourgeois and Proletarian Public Sphere by Oskar Negt and Alexander Kluge. Found Habermas’ account of the public sphere lacking so was fortunate to find a copy, despite its fragmented account of proletarian public spheres, in the library. 3. Bukal ng Tubig at Apoy” by Levy Balgos De La Cruz. The copy at the library is missing so was fortunate to get one from Bookay-Ukay. Its introduction includes perhaps one of the sharpest ars poetica on literariness and breaking of literary borders from within the ranks of the Philippine revolutionary movement. 4. The Southern Reach Trilogy by Jeff Vandermeer. I actually had books 2 and 3 from various secondhand shops but it took watching the film adaption of Annihilation to prod me to buy the first volume and read the entire thing. The books still opened more questions than answers though. 7. The Art of Cloning: Creative Production During China’s Cultural Revolution by Laikwan Pang. Title says it all: The books at how cultural sphere is organized differently in the high period of socialism under the Mao as opposed to the profit-driven culture industry which dominates the contemporary era. 8. 2666 and The Savage Detectives by Roberto Bolano. Got into the bandwagon late and read these two big books only last year because I only secured secondhand copies only recently. Couldn’t decide which is better but I can say the two are probably some of the best novels I’ve read ever. 10. A Marxist Philosophy of Language by Jean-Jacques Lecercle. Insightful critique of Chomskyian & Habermasian linguistics & an Althusserian account of language as one of the material links of the chain of ideological interpellation. Was practically my primary reference for my language class. 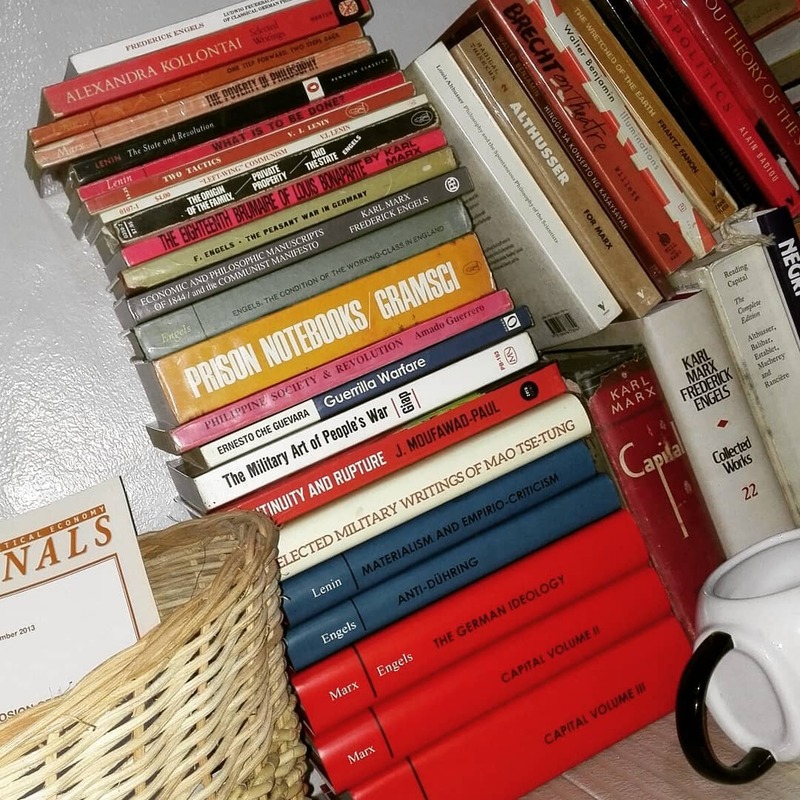 Other notable books I’ve read once that I’ve been perusing a lot in 2018 includes the following: (a) Pook at Paninindigan by Ramon Guillermo, Ang Panitikan ng Pambansang Demokrasya by Gelacio Guillermo, On the Reproduction of Capitalism by Althusser which I used for my literature classes; (b) Translation and Revolution also by Ramon Guillermo, The Wretched of the Earth by Fanon, Waiting for Mariang Makiling by Resil Mojares which were staples for my Rizal classes; (c) Hegemony and Socialist Strategy by Laclau and Mouffe which my thesis adviser and panel critic had me read, thereby leading me to go back to Badiou’s Theory of the Subject and Bruno Bosteels’ Badiou and Politics as counterpoints; (d) Capital, Volume 1 by Karl Marx which I’m reading for the second time for a reading group.